For a long time, I've been expecting to see a lot more integration between calendar events and location information. For example, you should be able to have a Google Map inside your Google Calendar and see pushpins for your event locations. This would enable you to have directions built right into your calendar appointments. You can already create an HTML link to a map or GE file for a calendar event right now. And, while you are perusing in Google Earth, you should be able to turn on calendars of events to see what is happening. For example, while looking at New York you should be able to turn on the "broadway show" layer and see placemarks for what shows are showing tonight and where they are located. And, the placemark description should have a link to buy an E-ticket. Just last week, someone in Austria announced a cool web site which is a big step in the right direction. 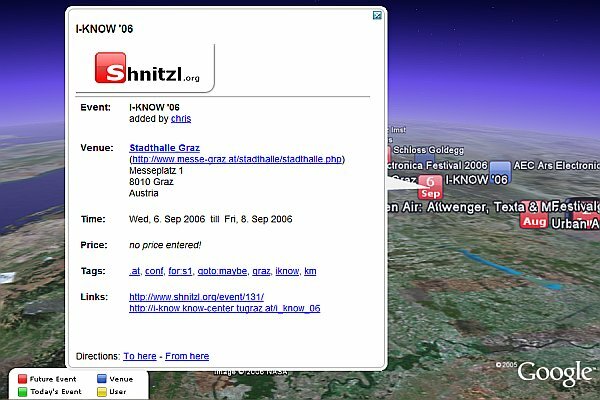 The web site has the whimsical name of Shnitzl, it's free, and it lets you create events and show them in Google Earth! Right now there is just a few events mostly in Austria. But, anyone can open an account and create events for anywhere in the world. Look at the network link for the events here. One thing I like is that it has color coded icons according to whether a placemark is a future event, current event, past event, or just the venue for an event. And of course, you can use Google Earth to get driving directions, check out the satellite photos, search for a place to eat before or after, etc., etc. Cool system! Just registered and entered two new events (both concerts) that I will be attending: one in the Netherlands and one in France. Also, I like the fact that multiple events at the same venue get different heights "above the venue" in Google Earth based on how far in the future the event is. This makes it easy to distinguish different events by tilting. I think they should integrate Picasa into GE, so you can click on a placemark and see pictures you associated with it - good for holidays etc.